First there were crop circles, now there are… rock circles? In California’s Death Valley, a remote dry lakebed holds a secret! Rocks scattered across its parched surface have mysterious trails etched behind them. It seems the rocks move! But how? Scientists have theorized that howling gales push them, but some weigh almost seven hundred pounds! So in 2011, paleobiologists from the University of California San Diego investigated. 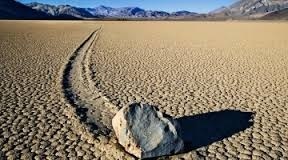 They fitted GPS trackers onto fifteen lakebed rocks. They also visited regularly, to observe. Finally, in November 2013, rain filled the lakebed with three inches of water. In December, an overnight freeze formed surface ice, windowpane thin. The next morning, sun and wind cracked the ice into huge floating panels. And the rocks slowly moved! How? The wind-driven ice sheets literally shoved the rocks along the slick lakebed! Later, the ice melted, the water evaporated, and the rocks’ trails were revealed. Mystery solved, thanks to film. Call it a slow-moving – if exciting – rockumentary!